Humility about the future! We don't control tomorrow. 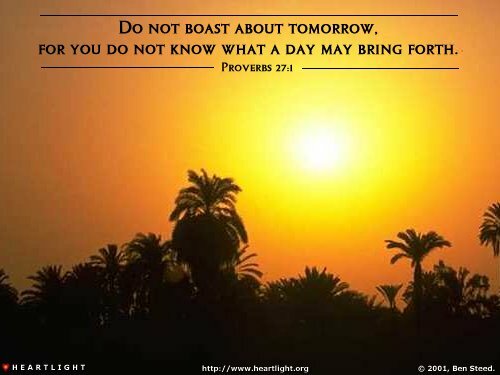 At other times in our lives we may have taken tomorrow for granted; not so anymore. Tomorrow may not come. Tomorrow something horrible could happen. Tomorrow everything we possess could be gone. In the face of these discouraging possibilities, is there anytning positive we can hold onto? Absolutely! We know that God holds tomorrow in his hands. We know that because our life is hidden with Christ in God (cf. Col. 3:1-4) our tomorrow is secure. It might not be what we expect. It might not go as we planned. But, it will go as God determines and it will end up with us sharing in his comfort, victory, and glory. Father, my tomorrows all rest in your hands. I ask that I can be useful to you today; courageous enough not to worry about tomorrow, and loyal enough to not waver in my love for you and my commitment to you. In Jesus' name. Amen.